The therapy pool is primarily for patients of Physical Therapy, but is available to all members of the health club on a first-come-first-served basis. 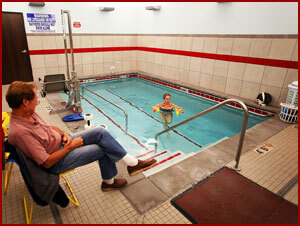 The therapy pool in the physical therapy clinic is designed for therapy and low impact aerobic exercise. The temperature is maintained at 89 - 91 degrees. Aquatic physical therapy uses buoyancy and resistance of water to create a unique exercise environment. Our warm-water pool makes exercise easier and less painful for people recovering from injuries or suffering from chronic conditions. Aquatic physical therapy also uses hydrostatic pressure to decrease swelling and improve joint position. The warmth of the water relaxes muscles and improves blood flow to injured areas. People with muscle spasms, back pain and fibromyalgia typically find aquatic therapy especially beneficial. In the Endless Pool clients work independently on exercises they have learned. Aquatic Therapy gives them an opportunity to rest and rehab overused muscles in the nearly weightless environment. Chest deep water dissipates 80% of a person’s body weight so an athlete can often work out at an intense level without risking further damage. The endless lap is a large jet of water at one end of the pool that provides an adjustable water current to swim or run against. Effectively a treadmill for swimming. A hydrolic chair lift was recently added to give safe and comfortable access to the therapy pool for everyone. Private and small group swimming classes are taught on a regular basis. Contact the front desk for details. provides assistance and support. It is used to decrease gravitational forces places on weak limbs that are less able to bear weight. Buoyancy allows a person to move more easily with decreased stress on muscles, joints and bones. 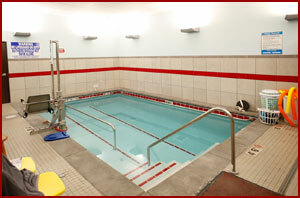 Aquatic therapy is provided in a heated pool.. The warm water relaxes muscles and allows for improved join range of motion. The water surrounding the body helps circulate blood from the legs to the heart often reducing swelling in the ankles and feet. Once swelling is reduced, joint tenderness may decrease and range of motion can increase. Allows for improvement in balance and strengthens all muscle directions. On land, resistance is felt in only one direction, which leads to an over development of some muscles and under utilization of others. Resistance also increases sensory awareness.